It is reported that Churchill and Hitler nearly met in a Munich hotel in the 1930s. The event is portrayed in “The Wilderness Years” television series (1981), where Hitler glares balefully on Churchill, who is sitting in the hotel restaurant, unaware of the presence of his future antagonist. Were Churchill and Hitler actually in the hotel at the same time or did this portrayal involve artistic license? They were not in the hotel at the same time, so artistic license was involved, but the meeting was definitely proposed, and nearly came off. In late August 1932, Churchill traveled to Europe to tour the Danubian battlefields of the First Duke Marlborough, whose biography he had undertaken. 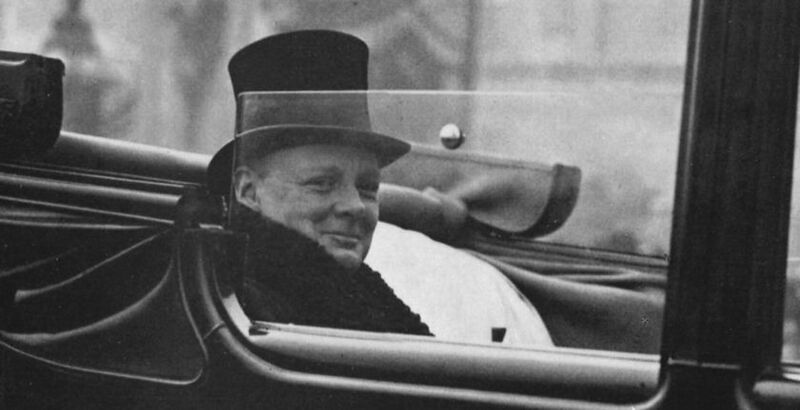 Churchill recalled in The Gathering Storm:1 “After passing a day on the field of Blenheim, I drove into Munich, and spent the best part of a week there. At the Regina Hotel a gentleman introduced himself to some of my party. He was Herr Hanfstaengl, and spoke a great deal about ‘the Führer,’ with whom he appeared to be intimate.” Churchill proposed meeting Hitler for dinner. “I landed with Hitler at Munich airport to find a telephone message awaiting me from Randolph. His family were staying with a party at the Hotel Continental (not the Regina Palace, Sir Winston’s memory plays him false), wanted me to join them for dinner, and hoped that I would able to bring Hitler along….” Hanfstaengl duly invited Hitler, who was reluctant: “What on earth would I talk to him about?,” he reports the Führer as saying. Hanfstaengl himself joined Churchill, who was dining with his wife, their daughter Sarah, Randolph, and Frederick Lindemann, his friend and academic adviser. Determined to have another try, Hanfstaengl excused himself and went in search of Hitler, whom he found in the stairway of his apartment “in a dirty white overcoat, just saying good-bye to a Dutchman… ‘Herr Hitler’ [Hanfstaengl said], ‘don’t you realise the Churchills are sitting in the restaurant?…They are expecting you for coffee and will think this a deliberate insult.’” Hitler said he was unshaven and had too much to do. Hanfstaengl suggested he shave and come anyway but Hitler, perhaps considering that Churchill was out of power and of no consequence, never showed up. The Harvard-educated Hanfstaengl is generally thought to be reliable. As Hitler’s representative to the overseas press, he tried to exert a moderating influence, but fell out of favor in 1936. Suspecting that Goebbels and others planned to assassinate him, he hastily left Germany in 1937. Immigrating to the United States in 1942, he advised Roosevelt on Hitler and the Nazis, and later wrote his book, originally entitled Unheard Witness.